Until this year, Carol Travis had attended every Council 2 biennial convention since 1985. That’s 14 conventions covering 28 years — without interruption. But she broke this impressive record when she was unable to attend the convention held in Spokane in June. That would be the convention at which she was presented with the prestigious Mary Hersey Award. True, she had a good reason for not attending this year’s convention. 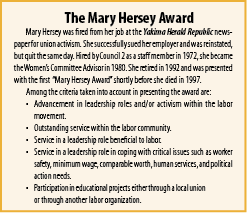 After all, she had retired from her position in the business office at Prosser Memorial Hospital and therefore from the executive board of Council 2, in October. And she needed to attend her son’s wedding in Virginia taking place at the same time as the convention. That note — which Bingman also read at the general session of the convention — pretty well sums up Travis’s approach to the union to which she has devoted so many hours and so much time away from family over the years (she says her husband and children were really understanding) . Travis demonstrated this approach over the three decades during which she served several terms as vice-president and president of Local 874-H, having also been elected to the local’s executive board and on the state executive board. Travis attributes her approach to the “middle-child syndrome.” “Because I am a middle child, I grew up to be a peacemaker,” she adds. Her drive to be fair was tested when the Great Recession forced management to seek concessions from the union. “We would vote to defer pay raises for ourselves in order to prevent some of our members being laid off,” she explains. “That seems fair; I would rather see other people being able to keep their job or even to keep the hospital open than insist that I should get my full pay. “I am a kind-hearted person. Says Council 2 Staff Representative Kevin Dougherty, who represents the area in which Prosser falls, “Carol has always impressed me with her involvement in union activities and her leadership. “As a local president, she was fearless with management.